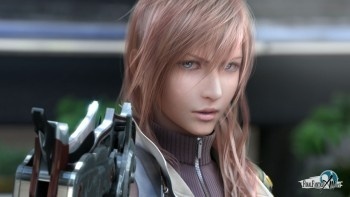 Combat in Square-Enix's Final Fantasy XIII will center around pseudo-real-time battles and chaining attacks. No word about super attacks with five-minute-long animations and pointless Christian symbolism. While we still know little about FFXIII's plot or when it's coming out (if it ever does), Square-Enix has just taken the wraps off one of the most crucial aspects of the game: the battle system. From the sounds of the information revealed in a number of Japanese magazines, it seems like FFXIII's combat won't be nearly as adventurous as FFXII's somewhat controversial system, but will still make a number of drastic changes to the traditional formula. Almost all of the FF games' battle systems feature some variation on the franchise's trademark turn-based "Active Time Battle" system where characters have to wait until a meter fills to act, and FFXIII is no different. Only this time around, there's a single meter for the entire party (as opposed to each character) that fills over time, and you don't have to wait until it's full to use it. Instead, the meter is divided into separate units, and different actions cost different numbers of sections. After enough of the meter is filled to make one unit, you can use a regular attack or an item. If there are more units or the meter's completely full, you can spend them on multiple attacks or other actions. Fancier spells and the like require more units, naturally. Meanwhile, as you chain consecutive attacks, another meter fills up in the top right of the screen. Successive chains do more damage, and when the meter's full, you can enter into a special "Break" mode where all enemies take more damage and can even be juggled in the air for maximum style. Furthermore, battles don't take place on separate screen, but automatically begin whenever you come into contact with an enemy on the field. No word on how summons will play a role, or what form Limit Breaks / Ultra Super Arts Plus or what have you will arrive in. I just hope you'll be able to skip through the mini-cutscenes that always play whenever you do one. While we still know little about FFXIII's plot or when it's coming out (if it ever does), Square-Enix has just taken the wraps off one of the most crucial aspects of the game: the battle system. From the sounds of the information revealed in a number of Japanese magazines, it seems like FFXIII's combat won't be nearly as adventurous as FFXIII's somewhat controversial system, but will still make a number of drastic changes to the traditional formula. A little mistake there no? sounds a lot like the Valkyrie Profile battle system to me, with a little more of a turn-based twist. We can guess he meant FF XII, more than likely. I loved FFXII's battle system, it was the most fun I've had in an RPG. Sounds a lot like Magna Carta to me... and that is worrying because that game was f'in terrible! Sounds a little dodgy to me. I mean, it's all the same to me, either way, but I doubt everyone who complained about the last system is gonna be happy with this. Sounds like they're trying to shake things up......again. It sounds rather odd, but it can't be worse than XII's system. I don't think its a terrible thing that they aren't completely adopting a new combat formula. After all, fans of Final Fantasy are going to want something recognizable to the series they know and love. The thing that has always been key to Final Fantasy's development wasn't an overall change to combat but rather the touches (FFVI's Espers, FFVII's Materia, FFX's Sphere System). It seems like they're adopting a new approach that is actually more of an advancement than I would have expected. Though their attempt at a new battle system with Last Remnant failed to most people so I worry for the game's fate nonetheless. One thing I have learned to like about FF series, is itÂ´s potentiality to try out new mechanics under established concept. Sure, the potential probably could be utilized more effectively, but at least they are trying something new. I just hope that FF XIII`s battle system have learned from previous instalments and really introduces an exciting and working system. Anyway, sounds good so far. Judging by what I've seen of the characters in the new FF game I'm already not buying it. Though I am curious as to how they are going to change the combat system. I actually dont mind about combat systems. Final Fantasy is one of those series where I will openly admit to playing for the fancy graphics and epic plots. To me, the battles are just a way to progress the storyline along. Theres only a handful of JRPGs that I have played where I cared about how it handled, but most of them do the job. Bah! GDC'll take the life outta you. I did mean FFXII, and it's corrected now. Thanks. I think it's good that they are going back to a more traditional FF system. FF X had the best system yet, since it took turn based combat and polished it very nicely. Well that would be a pretty tough feat to pull off. Not really seeing how 12 has the best system. And if you want to debate bring it and i'll prove you wrong. Not really seeing how 2 has the best system. Wait, what? I said twelve had a bad system, and you want to prove to me that 2 had a better one? I must admit I'm a teeny bit confused. Stupid 1 key was jammed, I meant 12. I don't want to challenge you but please explain why you like the system and prefer it to the other FFs. I love hearing these point of views of gameplay elements like this. I liked it myself, but wouldn't call it the best. Aha, thought it sounded a little strange, I'll admit I did like some things about the battle system in 12, the way you could program your companions to do things like heal you when your health dropped to a certain level, but I just found it irritating having to circle around your enemies while you waited for your attack to recharge. Okay i'll be quick about this, i'll get more detailed if anything requires more explaining. First is how liberating the system is, your not forced to be traditional, your not forced to play this click a point n' click, you don't have to play this as one character or 3. If I wanted to? I could set the options to Wait, turn off gambits, and control each character individually, traditional except people can move freely. OR I could set gambits to my other two party members and simply control a character the same way you would in say... Neverwinter Nights. OR I could give everyone gambits and run through areas filled with weak monsters. OR I could control all 3 in real time, or control 2, program the Gambits to be like me, like my friends. No other RPG gives you this freedom of play style. While it isn't as fast as say... oh FFX-2 that's a non-factor it's fast ENOUGH and it plays like a tacticle experiance. I spent the whole game once holding Vaan back while I tweaked the Gambits on my allies to play commander, I felt like I was leading troops. Everything was balanced, Charge helped keep magic up and you had so MANY combinations. Like I said, it isn't the fastest, but it is the best. after all what is better? I think XIII might actually be more fun. NOTE: Keep in mind It does all this while still not crossing into Action RPG territory. Thanks for the detailed description, you made quite a good point there. I probably just couldn't get into proper gambit tweaking to be effective, I tend to prefer when I'm in full charge of the action at all times rather than having my team run on autopilot (I guess I could have, but it seemed a bit hard to do). My main complaint is the spacial aspect of the system, however. I disliked running around enemies and them being able to hit me while actually not being exactly next to me (like when I was running away). This spacial aspect led to my archer being pretty much untouched while my squad was being raped in close combat. Anyway, it was a good system and I'm not sure why it is being hated so much. The main reason I disliked the game was the stupid 12 year old hero...the game somehow made airship pirates seem like pussies...sigh. Interesting, but to me it just seemed like a glorified autopilot at times. But it's at least true that it's flexible. Asn an outsider of tthe Final Fantasy series of games, what does this mean for me? I.e, can you explain this in laymans terms? But if it feels like Auto-Pilot then turn it off, that's the beauty! Despite the free-roam aspect your controlling your 3 party members JUST like in the old games, except you can cancel actions on the fly. Plot is an entirely different thing, while I liked the plot (And Vaan is 17... just saying) I will admit the games LARGEST flaw is it's fucked pacing, while the story would be cohrerant at some times at other times it became very dragged out or TOO quick. But yes I accept the problem that the enemy may be far away and still somehow bite you. As for Archers? well I actually found that yes it was a tiny problem, but not too big. I mean it adds some sort of realisim that we have finally advanced so far that they just take less damage. I guess the next improvment is to have the AI literally plot battles based on your play style, hence if you use an archer and two tanks they start putting enemies with huge defence an far range attacks, or blind/immobile. I mean THAT would be a truly fun game, because you can't stick to one play style because the game becomes accustomed to it and undermines your strategy. The only reason I dislike the old battle system was because of the loading between the world map to the battle screen. XII had no random encounters, you can see what enemies are on the field and choose to fight them. It looks like XIII will keep this improvement while retaining the more strategic gameplay of a regular ATB battle system. no loading screens no extra waiting. Okay bar is filled with action points and fills slowly, every action takes action points, chains together to create more 'cinematic gaming' (which is what they were hoping for) without becoming a pure Action RPG. The main aim of the battle system (according to square) was to make a game system in whic you COULD do the crazy awesome stuff they did in cut scenes, so if your character leaps into the air spinning around like a buzz saw and slicing through enemies, landing and riddling them with bullets (hypothetical remember) so it's more fluid than Turn-based combat, but not Action RPG standards yet. the more complex an action the more points, so a basic attack is 1, fire would be 1, Fira would be 2 Firaga would be 3. You know how in WKC you can set up combo's? like that except different. Nope he's pretty old actually. About the XII system, I personally disliked the gambits because I found that they served to make the game play itself. Granted, that's just because everyone that did it up that way were complete toolboxes (I tried to avoid doing the same), but the gambit system lead them to it by the nose. Also, as noted, the attack ranges were a bit off at times, and that hurt the system a little. That said, I'll try out the XIII system before passing any sort of judgement on it. I have always done so in the past, but I'm pretty excited for this one in particular. They've had a lot of time to put onto it, and the X-2 chaining thing is back, apparently. It does sound pretty good, but as Yahtzee never fails to point out, *sounding* good doesn't mean it'll *be* good. I consider X-2 to have the best FF battle system of all time, by the way. This battle system sounds near-identical to the battle system of Wild Arms (or at least 3-5, I can't for the life of me remember the system in the first two games.) There is a meter with sections to it. Every time a battle starts, a character is hit, or damage is given, the meter fills up. Certain attacks eats the meter gauge, special 'chain' attacks devours more of it, and if it's full you can perform Ã¼ber special god attacks. I see nothing different in this sense. It's a repeat or rip of a battle system from another game polished up and made to look new. I consider it the fastest, not the best. And as I pointed out, Gambits could be turned off, if you wanted to be a tool you COULD program every character, but that just showed how much you sucked. A system like Gambits is ideal when dealing with AI partner, after all whats better? Okay I want you to heal a lot OR I want you to heal me with THIS spell and THIS SPELL ALONE if my HP drops below 60%, and if it falls before 40% use this one instead. Unlike your AI wasting magic on big spells after you get cut ONCE. Trying aimlessly to smack the fire elemental with FIRE and well... You get the idea.